On the terrain of the B&B are a number of horses kept for breeding and close by is Santiago’s riding school. He has a number of beautiful, well-groomed horses and can take you on one of his many beautiful routes. He knows the area and his horses like the back of his hand. There are several beautiful horses on the terrain of our B&B. They are kept for breeding in Andalucia so you cannot ride them. However, you can pet and cuddle them and give them a tasty snack. The horses love that bit of extra attention. The routes go through the mountains and/or alongside the azure-blue lake. Past farmhouses, between the olive trees, along winding sand paths by the lake of Zahara de la Sierra. Breathtaking views are not an exception. Sometimes you can see the mountain peaks of Sierra de Grazalema in the distance. The horseback routes are all on car-free or low-traffic roads. 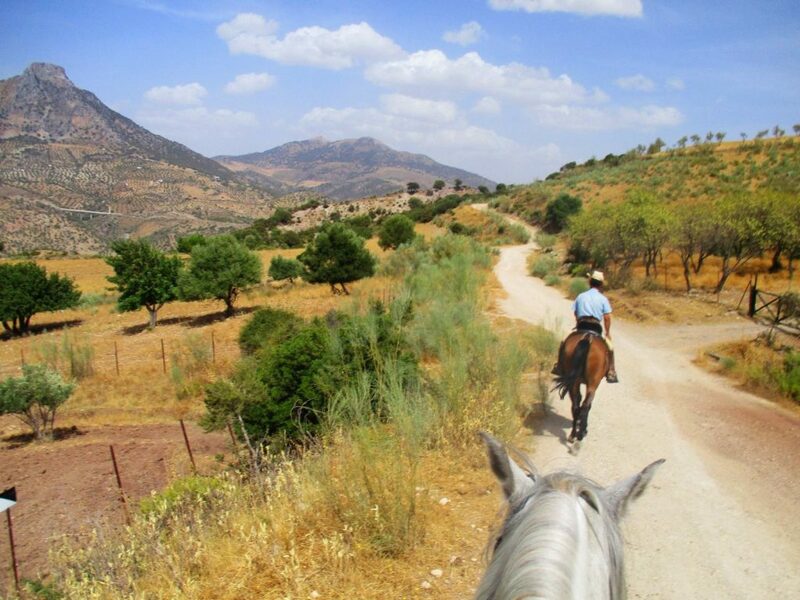 You will experience a fantastic day when you go horseback riding here in southern Spain! 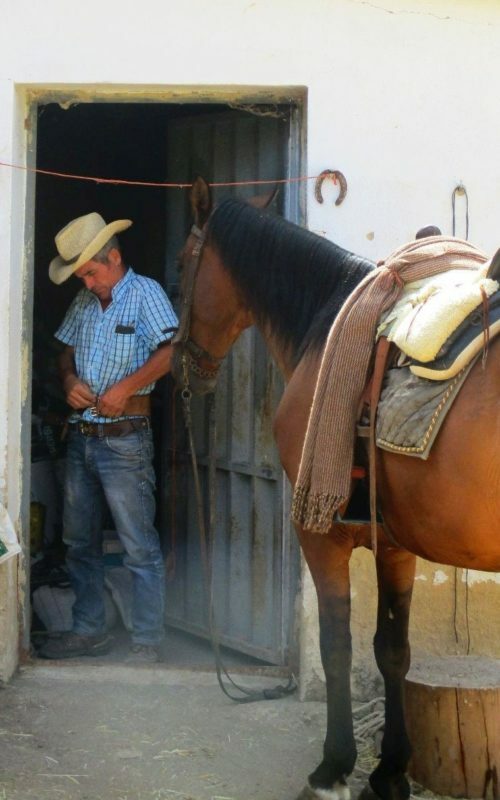 Santiago is the owner of the riding school and is a true authentic Spaniard. Small in stature, mischievous eyes, sun-burnt skin, never without his cowboy hat. He loves his horses and his horses love him. Santiago only needs to whistle and the horses follow him faithfully. That’s why if you’re an inexperienced rider it’s quite safe to follow these familiar routes with Santiago. Riding with small children is no problem either. Santiago has an extra rope to secure the horse so nothing can happen, or he takes the child with him to share his own saddle. Santiago also likes to talk about the surroundings and loves to joke. Unfortunately, he doesn’t speak English. We’d be pleased to make a reservation for you. You can of course also contact him yourself. 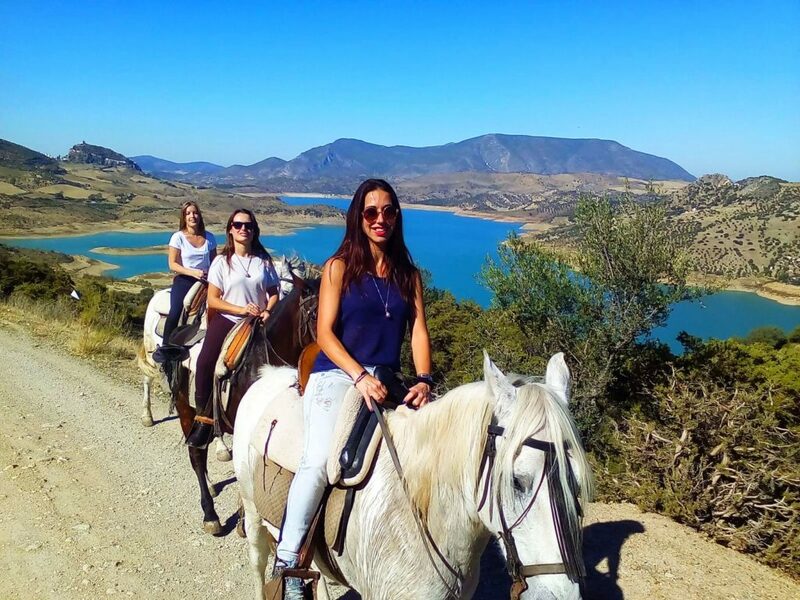 A one hour horseback riding tour is possible but if you have the time, at least two hours is really recommended. You will see much more of the wonderful rural life in Andalucia, southern Spain. After a drive of half an hour you arrive at the recreation area of Playita Arroyomolinos. It lies on the lake, a little beyond Zahara de la Sierra. You have to enter the parking lot, and then just before the entrance gate of the recreation area, turn right over a small bridge. It may seem like the gate of the parking lot is closed, but if Santiago knows you are coming the lock will be open! Tip: take your swimming gear for a refreshing swim in the lake at Playita Arroyomolinos! Almost everyone wants to cycle the famous Via Verde de la Sierra, a 36 kilometer long walking and cycling route that runs through a rough and mountainous landscape. The route is originally an old railway line. Which is why you can cycle through the Spanish mountains without having to toil, climbing and descending. Straight through the mountains on a virtually flat cycle path from Olvera to Puerto Serrano. Who can resist? There is a nice varied route for a hike from the B&B. You walk through untouched nature, from gently rolling to rough and rocky. There is also access to a wide nature reserve where you can walk for hours without seeing anyone. In addition, you are close to one of the most beautiful natural areas of Andalucia, Sierra de Grazalema. And the spectacular walk, Caminito del Rey, is only a 1 hour and 20 minutes drive away. From the B&B you can be in the heart of Seville within an hour. Seville has a small centre and is therefore recommended for a day trip. You can easily discover the whole city best on foot or by bike. Seville is truly a beautiful city with a friendly welcoming atmosphere that will amaze you.